Citizenship, what it means and how it matters, is a central topic in legal reform, in the development of Europe and in the maintenance of democracy. This book represents the work of a joint research project undertaken by the British Institute of International and Comparative Law with the Institute for Citizenship Studies. The aim is to stake out the boundaries of citizenship and to identify the scope and content of the relationship which it defines between the individual and the State. In English law citizenship is traditionally an external matter - linked to nationality and the right of abode. But in common parlance, citizenship also has an internal dimension of involvement within the State. 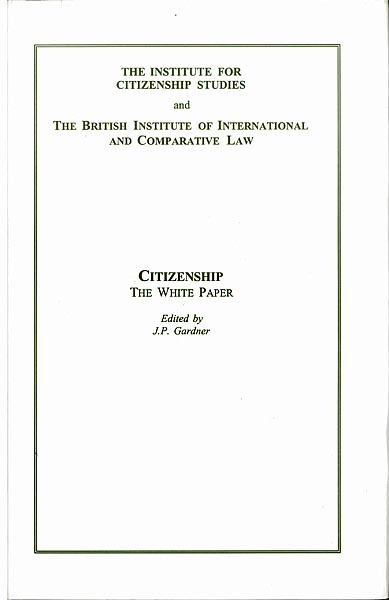 The research has identified the hallmarks of citizenship by comparing the key features of citizenship in European countries, and the 'White Paper' now presents a short description of those rights and duties which bind the citizen and the State in England and Wales. The topics range from voting, through litigation to paying taxes and performing jury service, and provide a basis to distinguish between rights of residence, citizenship and human rights. With Chapters on gender treatment, corporate and European citizenship as well as the role of citizenship in the emerging democracies of central Europe, this is a first step towards systematising an area of law of growing importance. The full price for this book when not purchased via the website is: Members £30 Non-Members £50.